Well we have just finished the season with a fantastic event at Bolsover Castle in Derbyshire. Not only did we have good weather, being mainly sunny, we also had a wonderful crowd – 800 on Sunday and 1700 on Monday . Monday’s crowd were also the most enthusiastic we have had all year and had a great time during the tournament! Thanks to everyone who came to see us and thanks for all the great comments , we really enjoy what we do and it is nice to know that you do too! I have some pics to share with you of the event – the first is lovely daughter Ellie in the apron she has made herself for her role as the kitchen maid. She has been assisting Jane the cook this season and has really enjoyed herself cooking over an open fire. An interesting and very useful role as we all really look forward to our banquet at lunch! See how lovely and sunny it was on Sunday! The apron is completely hand stitched and made of linen and Ellie has even done some very neat stitching at the corners to give it a bit of decoration. She plans to add some embroidery to the hem for next season. 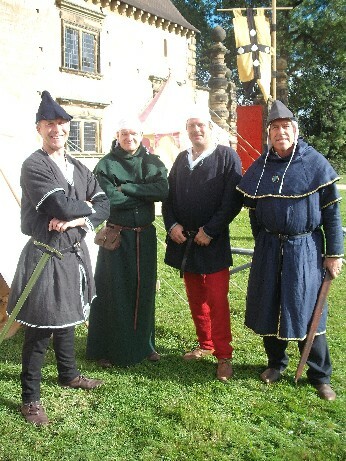 The next pic is of the boys on Sunday morning showing a variety of styles of medieval dress. John Neville (Mark) wearing a black felt bicocket hat and a black linen tunic with layered sleeves. Sir Hugh Despencer (Dave) wearing a green wool full length tunic with dagged chaperon (hood) and a white line coif on his head. Sir Henry Percy (Pete) in a blue wool tunic, very fetching red wool hose and a linen coif. Sir Hugh Bardolph (Paul) in a blue linen tunic with layered sleeves and matching chaperon, white linen coif and blue felt bicocket. In the mornings of our shows we do various displays and activities so the boys are dressed ready for those. 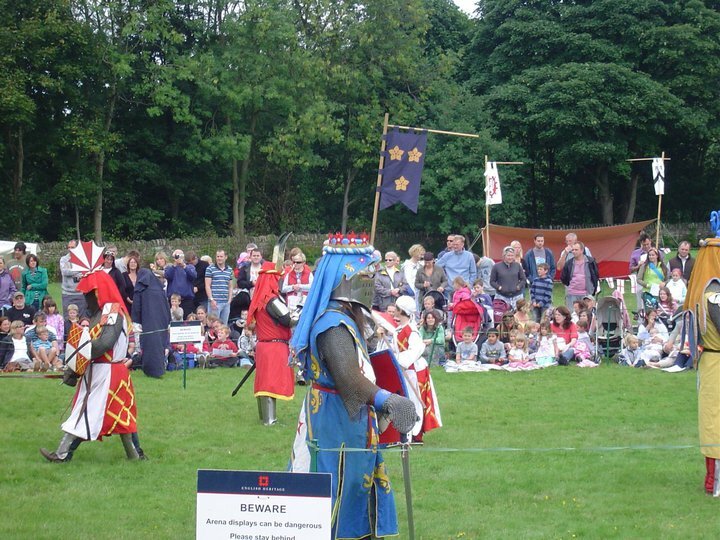 They run the joust and knight’s training for the children, the stocks, the weapons and armour talk and the children’s quiz. The women in the group do talks on headdresses and embroidery, cooking (live action here as they prepare lunch!) and calligraphy where the children can get their certificates signed after they have been knighted and practise calligraphy by making a bookmark. 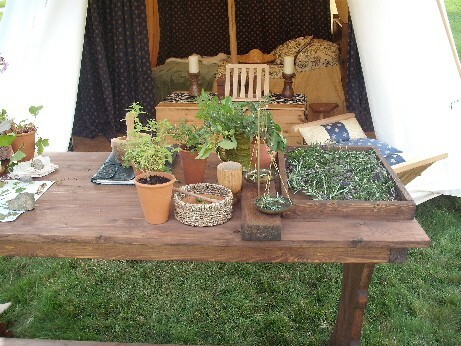 This show we also had a new talk which was done by Lady Bardolph on the use of herbs – here is the lovely display she had outside her tent. Lady Bardolph is an excellent embroiderer and had brought the finished goldwork and beadwork piece she started at our needlework day earlier in the year – unfortunately I did not have chance to take a picture of it! 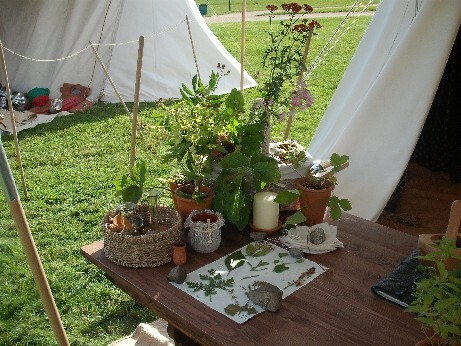 After the banquet lunch we have the manorial court where medieval justice is dispensed, then the archery display and talk, the children’s re-enactment (strictly non – contact, just a chance for them to shout and throw pretend spears!) At the end we have the best bit which is the tournament. 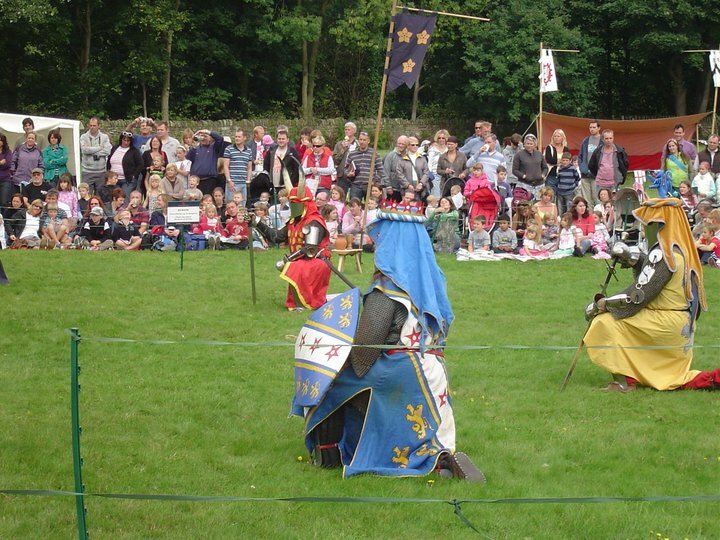 The children like this as it is a chance to see the knights hit each other round the head but I like it as everyone looks so wonderful in their costumes! I mentioned in an earlier post that the knights have all made themselves mantles to decorate the top of their helmets which look very impressive when they come out of the tent into the tournament arena. 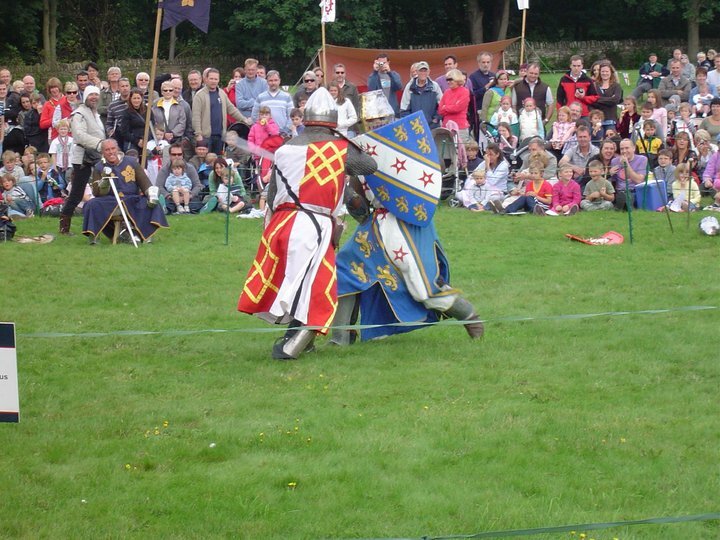 Most of the knights wear great helms which have a flat top to them – ideal for displaying your heraldry! I have not been able to take close up pics but thanks to my friend Jan here are the boys at the start of Monday’s tournament looking splendid. I think de Bohun’s (another Paul) outfit is definitely my favourite one – he made it all himself – the surcoat is painted and the little crown of stars on the helm is made of wood. Paul is an incredibly talented graphic artist and he has been working on some images of all of the knights that we can use as publicity for the group. 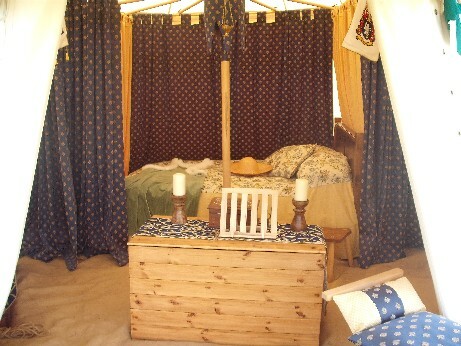 You can go and see his work at his web site and admire all our heraldry. Well apart from tidying away kit (and making a mental list of all the things I need to make for next season!) I have been starting on my Xmas ornies for this year. Have finished stitching on the first JBW reindeer so will post a pic of that soon. Also have two Autumn exchanges to make as I have now signed up to another exchanging blog as well as the All Seasons one. I will be starting one of those tonight. Am a bit sad that the season is over but am looking forward to all the nice winter evenings sitting in stitching with my candles lit. I am buying myself a new sewing machine as well – with some birthday money from my Mum and lovely kids – which is good as the old one has now packed up. I have also signed up for a Stitched and Painted Textiles Day School in November at my local Adult Education centre and have booked my ticket for the Harrogate Knitting and Stitching Show as well – lots of stitchy loveliness to look forward to! We also have the start of term to look forward to and this one is particularly exciting one as Jake is going to sixth form! He did really well in his GCSEs (only didn’t pass French) and has enrolled onto a Diploma in Art, Media and Games Design which I am sure he will love. He starts college tomorrow and all my new teacher trainee students will be with me the week after next. Thank you very much again for visiting and I hope that you have a good weekend ahead.